Discover The Art Of Breathing Life Into The Inanimate! at Puppet Place HQ as part of this year’s Bristol Festival of Puppetry. Celebrate the thrill of engaging with objects and environments that unexpectedly move, act and respond. Stop motion models, automata, animatronics, puppets and robots will be on display, with new talent exhibiting alongside award winning resident companies Green Ginger, Pickled Image and Rusty Squid. The previous two Open Doors days have been wildly successful, attracting over 30 exhibitors and in excess of 500 visitors. Come behind the scenes, meet the designers and makers, and learn the secret of bringing stuff to life. Join Bristol’s Puppet Place community for an afternoon of exhibitions, demos, tea and cake! 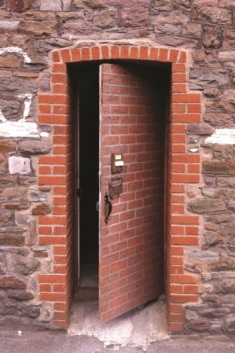 Entry is Free! bring you a spectacular event! 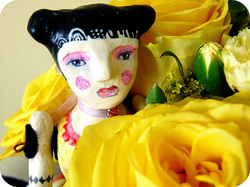 Join us to celebrate the art of dollmaking as DAG turns 36 years old and GDS is 30. Expect originality, music and refreshments. Everything in our shop is Made In Bristol by skilled designer makers and this is your chance to be the first in line to view our brand new collection. 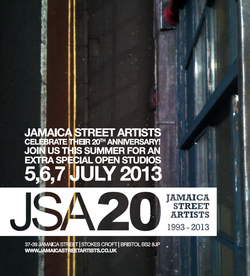 Jamaica Street Artists celebrate their 20th anniversary, 1993 - 2013! Drawn aims to raise the profile of drawing, presenting it as both an autonomous discipline and an interdisciplinary tool. 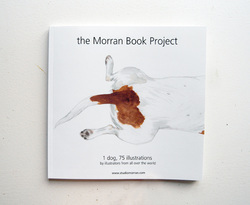 From artists who either draw, or explore the concept of drawing in their work,. The show features work from illustrators, videographers, sculptors, printers, embroiderers, typographers, animators and architects. Monday - Saturday - 9.30-5pm Sunday - 11 - 5pm Last admission half an hour before closing. This event forms part of the Semana Cultural organised by the Department of Hispanic, Portuguese and Latin American Studies. I will be reading my poetry (in Spanish) and talking about my work as an artist here in the UK (in English) on Tuesday 12th from 3 to 4pm. Have a look at the rest of the events. It will be very interesting! (15-17 Woodland Road, BS8 1TE ). 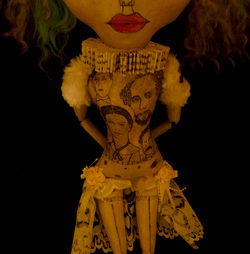 I am happy to announce that I am part of this amazing Christmas show 'The Island of Misfit Dolls' which runs from December 9th 2012- February 2nd 2013 in Ontario, Canada. Dollirium Art Doll Emporium is Canada's leading art doll gallery showcasing one-of-a-kind art dolls by international artists from around the world. This unique gallery is a definite must-see for art lovers. Located at 1 Cliftonvale Ave. London, Ontario Canada. You will be able to see the dolls on the show and purchase them from their website too! Back for a third successful year, the Jamaica Street Artists pop-up Christmas shop is Bristol’s most exciting present-buying opportunity. 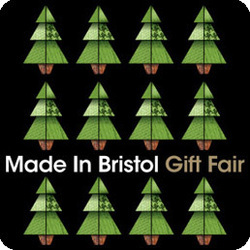 With limited edition prints, an exciting selection of greetings and Christmas cards, Christmas decorations, books, hand crafted fabric creations, t-shirts, as well as original artwork, the Art Box is a rare chance to see and buy work directly from Bristol's best-loved artist collective. The Art Box opens on Monday 10th December at the Showroom, opposite College Green – 10.30am – 6pm, (8pm Thursdays, when you can enjoy mulled wine supplied by our sponsors, Barefoot Wine). Until 23 December. Presenting the second exhibition of illustrations, paintings, photography and 3d work from international and local artists celebrating Mexico’s traditional 'Dias De Los Muertos'. 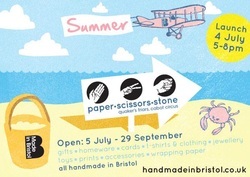 Welcome to the next instalment of Paper Scissors Stone, Made in Bristol's unique pop-up shop. Our shop will be bringing together all kinds of creatives; from ceramicists to textile designers, chocolatiers to furniture makers. You will be able to purchase fashion accessories, original art work, stunning jewellery and other skillfully created products directly from the people who made them. Our innovative, artist run shop can be found at the heart of the Bristol's busiest shopping destination - Cabot Circus. 11 illustrators from local collective, Drawn in Bristol team up with 11 Argentine artists and illustrators ~ creating artwork on theme's of ‘DISTANCE’. ▶ Featuring: Alejandro Agdamus, Dave Bain, Leo Antolini, Andrea Balogh, Daniela Bogado, Alex Bertram-Powell,Bruno Busnelli, Katy Christianson, Romina Berenice Canet, Martha Ford, Florencia Delboy, Natalie Hughes, Maria Julia Goyena, Jess of The Lions, Ivanke and Lola, Jenny MacKendrick, Juan Lado, Kyle Smart, Carlos Leiro, SPZero76, Lorena Ruiz and Sally Haysom. 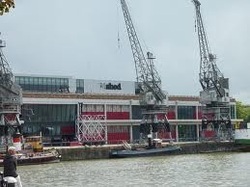 This exhibition previewed in Argentina in January 2012, and this is the Bristol leg of its journey. Show continues till end of July. JSA houses 42 emerging and established artists, working at a national and international level, including some of Bristol’s principal artists. 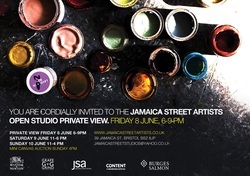 JSA’s Open Studios lifts the veil from artists’ practices, revealing how they live and work, providing a personal insight into this hidden world to all who visit us. 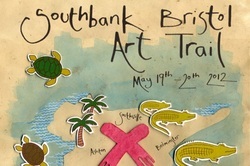 A major highlight in Bristol’s creative calendar, it is an essential event for art lovers, collectors and the curious. A Drawn in Bristol exhibition takig part in the inaugural Bristol Biennial festival at The Showroom. College Green from June 10 - 16. My print "The bear Tamer" together with work from other 5 Drawn in Bristol members will be exhibited at the M-Shed from 30th March till the end of May 2012. There will also be other of my prints for sale. Be swept up into the top-deck cabin and behold a wonderful treasure trove of illustration delights, goodies, gifts and trinkets. Hosted by Bristol's 50 strong illustration collective (Drawn in Bristol), there'll be plenty of framed original work, prints, toys, badges, cards and all manner of goodies - all fairly priced too! 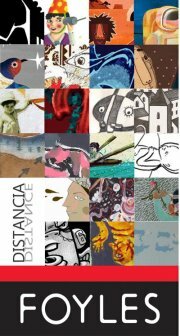 I have just curated an exhibition where 11 illustrators from Argentina and 11 illustrators from the UK ( members of Drawn in Bristol ) will be showing their interpretation of DISTANCE using various media on paper. 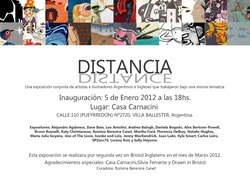 This exhibition will first take place in Buenos Aires Argentina in January 2012 in Casa Carnacini and later on in Bristol. The exhibitors are Alejandro Agdamus, Dave Bain, Leo Antolini, Andrea Balogh, Daniela Bogado, Alex Bertram-Powell,Bruno Busnelli, Katy Christianson, Romina Berenice Canet, Martha Ford, Florencia Delboy, Natalie Hughes, Maria Julia Goyena, Jess of The Lions, Ivanke and Lola, Jenny MacKendrick, Juan Lado, Kyle Smart, Carlos Leiro, SPZero76, Lorena Ruiz and Sally Haysom. The exhibition will be on till the 22nd of January. 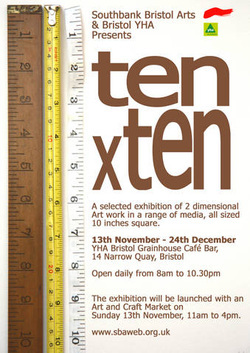 Southbank Bristol Arts' next exhibition, ten x ten, will be held from 13 November to 24 December 2011 at YHA Grainhouse Cafe Bar on Bristol's busy Harbourside. The exhibition will start with an Urban Art and Craft Fair from 11 am to 4 pm on 13 November. Two of my paintings have been selected. This is my character design of the Yeti for the Missing Link research project that will be presented as part of an art installation at the heart of the upcoming Pictoplasma Paris Exhibition at la Gaîté lyrique, taking place during the month of December. 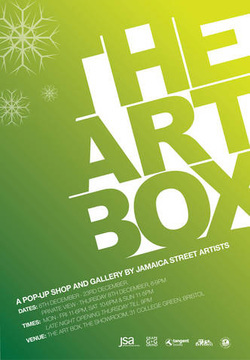 Jamaica Street Artists would like to invite you to the Private View of The Art Box, our pop-up exhibition and shop on Thursday 8th December 6-9pm at The Showroom, Park Street, Bristol. In conjunction with Bristol City Council’s Capacity Scheme, we have been kindly sponsored by Art at Bristol, Tangent Books and Grape and Grind. Come join us for a glass of wine and peruse the original and diverse work on display from paintings, prints, illustrations and much more by our national and internationally renowned artists. This is a great opportunity for first refusal of the works on sale and perfect if your looking for something special for yourself or someone else this Christmas. If you would like to attend please RSVP to jsadevelopment09@yahoo.co.uk . If you are unable to join us for the private view, there is plenty of time to see the exhibition, which will run until Friday 23rd December. 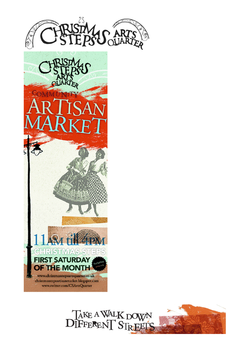 Festival market with a wonderful array of artists and crafters from the Bristol community! There will be live music and an arts corner. I will only be there the 11th of December but it is also on the 27th November. Where? Attic bar in Stokes Croft. 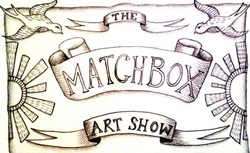 “The Matchbox Art Show” will be a selection of 50 artists creating mini masterpieces within matchboxes. The artists involved are from many varied disciplines and even hail from different countries across the globe. To catch this magnificent microscopic moment it’s running at Polish and Pin open house for the weekends of the 26-27th Nov and the 3-4th Dec.
On Saturday 3rd December, from 11am – 4pm, the beautiful and intriguing Christmas Steps Arts Quarter, in keeping with its reputation for independent artisan traders, is hosting a Christmas Artisan Market on the unique and festively name Christmas Steps themselves. 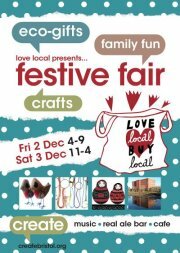 Come along for a lovely afternoon and experience the wonderful teetering charm of the artisans’ stalls cascading down the Steps, showcasing the high standard of beautiful crafts and wares – everything from sweets to filly knickers, original art works and handmade instruments, providing you with the perfect opportunity to pick up local, handmade and fully unique Christmas presents. There will be stacks of festive cheer with the famous Steps Christmas lights, as well as carols and mulled cider a-plenty and if that weren’t enough, there are many other artisan traders and businesses in this unique and beautiful site in Bristol’s city centre, as well as great places to eat and drink. Coinciding with Bristolʼs Christmas light switch on extravaganza on Friday 11th November at 6pm we will be unveiling our first Drawn in Bristol shop in Quakers Friars!! 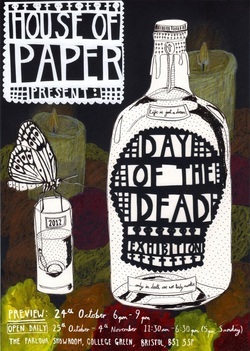 You can expect live drawing, music & drinks alongside our cornucopia of prints, cards and unique Christmas gifts. Plus from our doorstep you can enjoy the spectacular Cirque Bijou light show to celebrate the opening of the Christmas skating ring. I am at the moment organising an overseas exhibition in Argentina. The theme for the show is DISTANCE and and I have invited 10 members of Drawn in Bristol to create a piece of work on A4 sized paper for me to take to Argentina to display in January 2012. I have already arranged for a group of Argentinian illustrators to work on the same theme and their work will be displayed alongside the work from Drawn in Bristol. The whole exhibition will be also shown in Bristol UK sometime in March or April. To celebrate their four-year anniversary Nails Gallery is hosting a group exhibition titled ‘Paradise’. The artists were encouraged to use the title ‘Paradise’ as their inspiration. After careful consideration the artwork was selected and 11 artists from all over the UK have been short listed for their very first Nails Art Gallery Award. The artwork will be exhibited in the gallery in a group show titled ‘Paradise’ and the exhibition will start on 26th of September until 20th of October. The gallery will be open Monday to Saturday, from 9:30 till 17:00. The public will have the opportunity to vote for their favourite piece throughout the exhibition. The winner by public vote will receive ‘Nails Art Gallery Award 2011’. One of my paintings has been selected and will be there for you to vote if you think it deserves it. 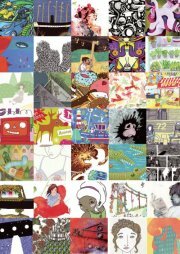 An exciting new illustration collective showcase, featuring a wide diversity of work from commercial to children's illustration to the down-right beautiful. 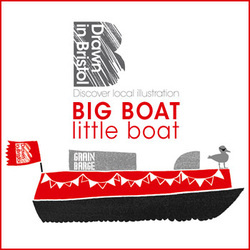 Drawing on local talent 'Drawn in Bristol' provides its clients with high-quality illustration work produced by experienced Bristol-based talent. Confirmed so far: Hannah Baber, Dave Bain, Andrea Balogh, Sarah Barnes, Alex Bertram-Powell, Romina Berenice Canet, Katy Christianson, Bex Glover, Ben Goodman, Naomi Hocking, Natalie Hughes, Loch Ness, Claire Shorrock & SPZero76. A piece of my work will be shown at the "Unsigned" anonymous art exhibition which takes place at the View Gallery, Hotwells, Bristol from the 1st - 4th September. During this event unlabelled postcards donated by around 150 artists can be purchased for a minimum donation of £20 with the proceeds going to The Prince's Trust. 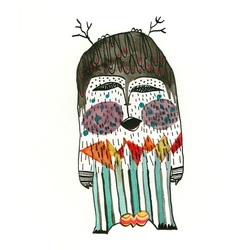 Now you can get some of my prints, jewellery and cards at ZION, a Community Art Space in Bedminster Down! Gloucester Road 212, Bristol, near the junction with Bishop Road. Room212 is Bristol's smallest art-gallery. I will be there for a week exhibiting my work and selling paintings, prints and hand made one of a kind jewellery and dolls! 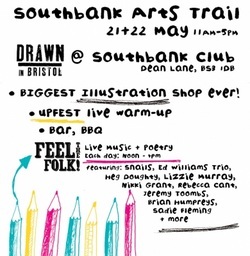 Drawn in Bristol take over the entire two floors of the Southbank Club, creating THE BIGGEST ILLUSTRATION SHOP Bristol has ever seen! The Fabulous Travelling Bag Folk Market Party! PLUS! * bearded lady competition * DUVET VOUS DJ's * busking entertainment * games, art & chill out space * acrobatics * bellydancing* and loads more! You are all more than welcome if you are around! I will be exhibiting at Malcom X, 141 City Road, Bristol, but there will be loads of things to see. I am very excited about the event. Come and say hi! More than 30 hand picked local and regional artists will be exhibiting and selling their work to the public in what's now known as Bristol's best art and craft Market. Open 10.30am - 4.30pm.